Just seenon Instagram a special edition Harrods black back with Harrods green bezel and Harrods engraved case back. Looks good, not sure about the coloured tip on the seconds hand. Looks OK for me, something a bit different from the norm. The extra green details make a difference, thank god it hasn't got Harrods on the dial. That really looks good. On a bracelet i would seriously consider one of those. They went with the faded lime look LV insert. Looks fantastic. Surprised it didn't happen before, other than on the bronze model. Do Harrods sell watches online? Having said that, if it says 'Harrods' anywhere on it whatsoever, i'm out. Wow, really looks great. Anyone know if the Harrods at Heathrow will have this at VAT-free price? Supposedly on the case back. Yeah I like the look of that, thanks for posting. Now that I like, pity it’s only available with the new bracelet. Last edited by Middo; 15th November 2017 at 21:41. I'd most certainly buy this. I just wish it had the silver dial elements like the black bay blue. I'd deffs put it on the older bracelet, but I have one on the BB41, so it would just fit on. Very nice! Are discounts normally available on the Tudor Black Bay? Assuming discounts won't be available at Harrods!? Love Tudor love the colour but Harrods is not for me thank God it doesn't say Harrods on the dial!!!! Not sure if I could even live with Harrods on the caseback... I'm sure it'll sell though!!! Good to see Tudor are reinventing the black bay and keeping it fresh! I really like that and would consider one for myself. Glad I am not going to be in London anytime soon as the temptation to pop in for a look could be expensive. That is very very nice, is it too much to have a BB Burgundy and a BB Green? I'm not in London anyway but a weekend away would be nice once the divorce money comes through hahaha. I do like the look of that but not sure about the Harrods connection. Might help to see a picture of the watch being discussed before post 24! Same as usual. Slab sided, rather than thick in an absolute sense. 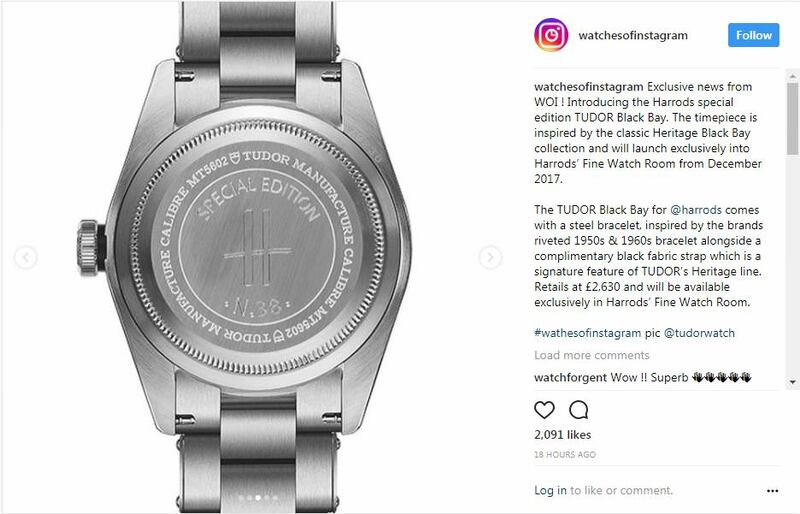 Saw some people on other forums saying its sold out, why Tudor makes a likely popular model a limited edition tie-in is beyond me. That would look great with my Harrods carrier bag. Last edited by Tony-GB; 16th November 2017 at 15:26. I like the other variants but not this one for some reason. I like the service from Harrods even less. Picture of the back anyone? Thanks guys.doesnt look OTT to me. Apparently this was initially planned to be a run of 100 but this has now increased to 175. As of 5 minutes ago Harrods had 187 names down. Surely the title should be "Horrid green black bay"? Love the Black Bay but don't like this colour combo same as I don't like the green subs that so many people wet themselves about. Disappointed that this has turned out to be a limited version. I hope that they bring back this colour bezel and no-date dial to a standard release. If it had silver dial furniture and hands, I'd be even happier. Agreed,but we are in the minority here and so must be wrong. Nice watch though, I like it. I have been told 100 numbered watches - all sold out but can reserve unnumbered watches. They were not able to say if the numbered/unnumbered have different pricing. How do people feel about the harrods connection? Tudor/rolex have a British connection so good in that respect and let's not forget the connection tiffany etc...have with Patek.Nearly forgot bucherer and tudor - do you think tudor is diluting the bay etc..too much with all these variations? I believe you can't have the Rolex group tax free ? Am I wrong ? I know for regular Tudors you can get the tax deducted. Rolex does not allow tax to be deducted. Oh ok, everyday is a school day..
Tax isn't deducted, how many times do we cover this? The dealer reduces the price of the equivalent to tax, which Rolex does not allow. Well aware of that, but it's much easier to just say tax is deducted rather than going through this whole thing every time. No one actually thinks Rolex can dictate tax law, they can dictate AD behaviour though. I like that there are variations. I saw the Blue Bucherer version in Selfridges last week and it looked nice. It's usually the low end watches like Swatch that were customisable but I'd like to see a variety of bezel colours available for a Black Bay and let the customer decide. Tudor have certainly embraced the idea of strap changing with the Black Bay, so they realise that customers like the ability to change the look of the watch. I think that looks pretty nice.